What The battle for Belorussia opened with Soviet partisans, who operated behind German lines, attacking rail links on June 19, 1944; this was the prelude to the destruction of Army Group Center. Three months’ worth of Soviet preparations included an elaborate deception plan that completely fooled the Germans, causing them to move their tank forces to the wrong place, away from the real point of attack. By June 20 the Soviets had concen­trated 166 rifle divisions, 1.25 million men, 2,715 tanks, and 6,000 fighter aircraft and bombers along a 250‑mile front. Three years to the day from Hitler’s launch of Operation Barbarossa, his planned liquidation of the Soviet Union, Stalin launched Operation Bagration, named after a general of the Imperial Russian Army who had opposed Napoleon’s invasion of Russia. The sheer numbers of Soviet men and equipment essentially guaran­teed that Army Group Center, in entrenched positions that had taken months to prepare, would be overwhelmed by the Soviet blitzkrieg. At the end of August 1944 the Germans had reeled back to within a few miles of Warsaw, the capital of Poland, fighting for their lives. The Germans lost over 130,000 men and 900 tanks, with a further 66,000 men taken prisoner. Another 105,000 men from the German Fourth Army, a compo­nent of Army Group Center, were lost when the Belo­russian capital of Minsk was re­captured on July 3, 1944. Soviets losses were 178,000 dead and 587,000 wounded. Why German-occupied Belorussia occupied a strategic position on commu­ni­cation lines going from Moscow to the West. By the end of 1943 the Soviets had 122,000 anti-Nazi partisans operating in Belorussia, where they engaged in terror campaigns against the territorial administration and sabotaged railroads, destroying hundreds of locomotives and thousands of railcars. With the successful conclusion of the Kursk campaign (July 4–13, 1943), the Soviet Army began a series of offensives on various fronts to push the Germans out of all occupied Soviet republics, the most spectacular one being Operation Bagration. Outcome The rout of German Army Group Center was the Wehrmacht’s gravest defeat on the Eastern Front. A total of 17 Wehrmacht divisions were utterly destroyed, and over 50 other German divisions were shattered. Combined with the start of the Soviet offensive in the Ukraine on July 13, 1944, Operation Bagration dramatically turned the tide of war against the Third Reich. The irreplace­able German losses, taken in conjunction with the Allied landings on the beaches of Normandy on June 6 (Operation Overlord) and the July 20 bomb attempt on Hitler’s life, demor­alized the Wehrmacht’s high command. 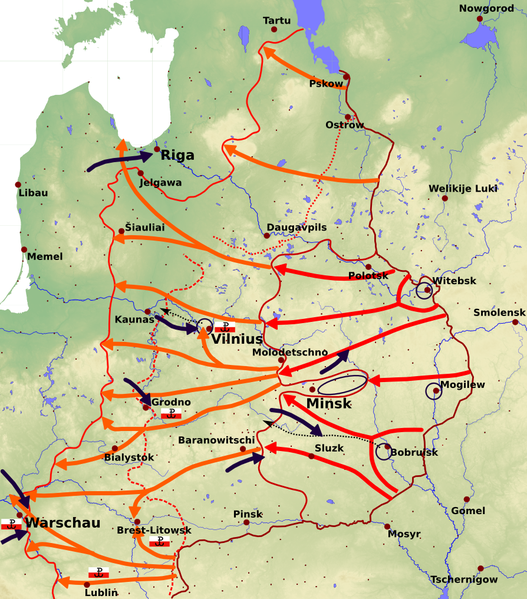 When Operation Bagration ended in late August 1944, the Red Army had liquidated German control over much of the Baltic States and had reached the Vistula River, the two nations’ former border in jointly occupied Poland. This put the Soviets within striking distance of Berlin.